User-mode drivers execute in user mode, and they typically provide an interface between a Win32 application and kernel-mode drivers or other operating system components. For example, in Windows Vista, all printer drivers execute in user mode. For more information about printer driver components, see Introduction to Printing. Kernel-mode drivers execute in kernel mode as part of the executive, which consists of kernel-mode operating system components that manage I/O, Plug and Play memory, processes and threads, security, and so on. Kernel-mode drivers are typically layered. Generally, higher-level drivers typically receive data from applications, filter the data, and pass it to a lower-level driver that supports device functionality. Some kernel-mode drivers are also WDM drivers, which conform to the Windows Driver Model (WDM). All WDM drivers support Plug and Play, and power management. WDM drivers are source-compatible (but not binary-compatible) across Windows 98/Me and Windows 2000 and later operating systems. Like the operating system itself, kernel-mode drivers are implemented as discrete, modular components that have a well-defined set of required functionalities. All kernel-mode drivers supply a set of system-defined standard driver routines. The following figure divides kernel-mode drivers into several types. 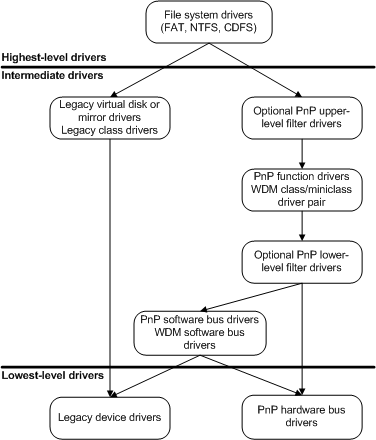 Highest-level drivers always depend on support from underlying lower-level drivers, such as intermediate-level function drivers and lowest-level hardware bus drivers. Function drivers control specific peripheral devices on an I/O bus. Filter drivers insert themselves above or below function drivers. Software bus drivers present a set of child devices to which still higher-level class, function, or filter drivers can attach themselves. For example, a driver that controls a multifunction adapter with an on-board set of heterogeneous devices is a software bus driver. Any system-supplied class driver that exports a system-defined class/miniclass interface is, in effect, an intermediate driver with one or more linked miniclass drivers (sometimes called minidrivers). Each linked class/minidriver pair provides functionality that is equivalent to that of a function driver or a software bus driver. Lowest-level drivers control an I/O bus to which peripheral devices are connected. Lowest-level drivers do not depend on lower-level drivers. Hardware bus drivers are system-supplied and usually control dynamically configurable I/O buses. Legacy drivers that directly control a physical device are lowest-level drivers.